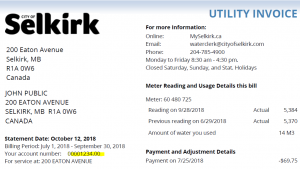 The City of Selkirk issues quarterly utility statements. Residents will receive a statement during the middle of January, April, July, and October. Utility bills are due by the middle of February, May, August, and November. See the Utility Billing Schedule below. Water and Wastewater rates are listed under our Water Rates and Conservation page. 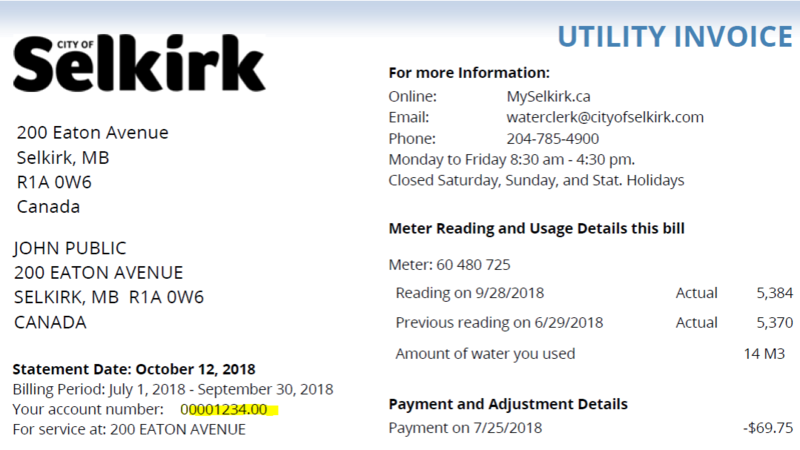 With the City of Selkirk’s Pre-Authorized Utility Bill Payment Program, your financial institution will automatically withdraw your Utility Bill payments on the 5th of the month the bill is due. You will still receive a Utility Bill in the mail for you records, there is no cost to register for this service. fill in your bank account information on the application form. You may want to confirm with your bank that all the necessary bank account information is included. You can change pre-authorized payments by providing us an updated application form. Please note we require up to 5 business days notice to make any changes. If the application form is incomplete, your account will not be enrolled in pre-authorized payments until the missing information is received. For more information on the Pre-Authorized Utility Bill Payment Program submit a CitizenSupport Ticket (Category: Water Billing). You can pay your utility bill at most banks or financial institutions through Internet banking, telephone banking, at an automatic teller or in person. If paying your utility bill through telephone, Internet banking or at an automatic teller, please allow 4 business days before the due date to allow enough time for your financial institution to transfer the funds to the city. Please be sure to retain a copy of your receipt. Enter the last 9 digits of your account number, without decimals. Our account numbers are 10 digits long, and are located on the top left corner of your utility bill (see example bill below). If you have sold a property and purchased another, or if you have moved in/out of a property, please be sure to correct your account information with your financial institution so that your payments will be applied to the correct account for your new property/new address within the City of Selkirk. Please allow sufficient time for your payment to reach our office by the due date. Please record your Utility Account Number on the “Memo” line of your cheque. Also detach and include the payment stub at the bottom of your Utility Bill with your payment. You can pay your utility bill in person at the Civic Office at 200 Eaton Ave. The office is open from 8:30 a.m. to 4:30 p.m. Monday to Friday. We accept cash, cheques and debit. A night deposit box is available for receiving utility bill payments during non-business hours. If you have paid by cheque or pre-authorized payment and your bank returns your payment as NSF, stopped, account closed, or account frozen, your account will be subject to a $40 service charge. Unpaid utility charges are subject to penalty of 1.25% if not paid in full by the end of the month the bill was due.